Dr.Body's signature beautification method "Non-surgical Kogao (small face) treatments"
Experience beauty treatments that address your bodily concerns in an effective yet non-invasive treatment. Our client’s bodily concerns range from physical ideals (such as flatter stomachs and slimmer bodies) to chronic physical ailments (such as posture and back pains) that often come with age. Many clients also come to us after having tried various other forms of beauty treatments…with disappointing results. 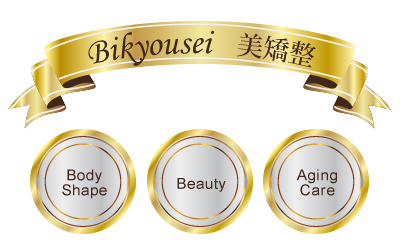 Enter Dr.Body’s signature beautification method, "Bikyousei", or “beautifying realignment treatment” in Japanese. The treatment combines massage techniques from around the world to specifically target the pelvic alignment and lymphatic system. By addressing bodily concerns at the root of the issue, our clients are able to achieve significant results. "Bikyousei" targets specific to full body concerns. The treatment itself frequently addresses concerns associated with slow metabolism. Our treatments encourage higher metabolism, which in turn boosts brighter skin and warmer body temperatures to help our clients maintain results for longer. The outcome of our treatments has become well known; with editorial coverage in magazines, numerous repeat clients including celebrities and rave reviews by bloggers, Dr.Body’s reputation as beauty experts has spread far and wide. Our professional staff is well versed in the Dr.Body beauty regimens and makes the perfect beauty experts to guide our clients through personal beauty concerns from a professional perspective. We believe in helping our clients gain confidence from their beauty from the inside out. By working together with our staff, it is possible to get closer to your beauty ideals in a healthy yet effective way.